FXCM is one of the pioneer providers of online trading, foreign exchange or Forex trading, CFDs, Stocks, Commodities, Indices and spread betting. Founded in 1999, the company main aim was to provide global traders with access to the world’s largest liquid market through innovative trading tools, support of excellent trading educators while all operated under strict financial standards. Since its development and great potential from January 2015 Leucadia has become the majority economic owner of FXCM. Leucadia National Corporation is holding company that withholds excellent reputation and invests in a diverse array of businesses, mainly in financial services and investments. The FXCM Group is headquartered in London (UK), offers dedicated 24/7 customer support service regardless of clients location through a global chain of offices situated in Germany, Australia, France, Italy and Hong Kong. In addition, through the banch of affiliated offices, since FXCM entered into partnerships with local companies, the broker provides access to the residents, in Greece, Canada, Israel and South Africa and becoming a truly global broker. FXCM strives to give the best trading experience, hence developing intuitive platform options, including the award-winning Trading Station and various attractive options for trading experience, alike numerous automated trading strategies and Applications available. Is FXCM safe or a scam? Is FSCM safe or a scam? In fact, the safety measure of the broker is its regulatory status and compliance to the international status which are overseen by the in depended authority under respected jurisdictions. The Companies that constitute the FXCM Group is regulated through several and actually the most strict world jurisdictions. The FXCM LTD is authorized and regulated in the UK, as headquarters there, by the Financial Conduct Authority. According to FCA regulations, the broker must follow strict financial standards, including capital adequacy requirements, present transparency of business practices accordingly, as well as to keep clients funds under protection while held in segregated accounts. For the globally presented offices, each of them as a branch of Forex Capital Markets Limited, follows country financial authority and licensed accordingly. Hence, FXCM Australia Pty. Limited and its affiliated office in New Zealand is regulated by the ASIC, FXCM Germany partially regulated by BaFin, authorized by CONSOB in Italy, acts as a member of the IIROC in Canada and FSP in South Africa. For the clients, whether one is new in the trading or experienced participant, FXCM brings a variety of powerful software trading platforms that help to achieve a trading goal. The FXTM software suite includes unique market access, with multiple order types, advanced charting enhanced by powerful utilizing tools and FXCM’s exclusive Real Volume indicator, automated trading strategies with testing and optimization capabilities and more. There are few options of the trading software to choose from, which includes Trading Station, FXCM’s award-winning proprietary platform, which features great innovation and functionality available on Web, Desktop and Mobile. Trading Station is often the preferred choice among active traders, however is the product with no matter of experience as it has a clear market vision and friendly interface. You still can use famous MetaTrader 4, yet with FXCM’s integrated and developed features that include EAs, scalping and 0.01 lot sizes with Free VPS enhance, but within the average trade of 500k. Fresh trading graduates can count on a company tool support while building your own strong trading strategy. Indeed, beginning traders facing numerous challenges, yet time and even capital loss due to emotion-based trading are the main barriers to success. To overcome these impediments, FXCM supports the functionality of Autotrading through market leading ZuluTrade and NinjaTrader platforms. Beyond core platforms, broker offers integration to FXCM’s acclaimed execution a specialty FXCM Apps offering an online marketplace where you can customize the trading experience. And to include an additional application for news, trends and range traders, apps for new trading features and smooth trading process, EAs and automation, indicators, scripts, Standalone apps and many more. Through a single account feature at FXCM you are able to trade all range of trading instruments that are included into the offering and includes Forex, Indices, Commodities, Cryptocurrencies and Spread Betting available for UK residents. Yet, there is another attractive opportunity through FXCM’s Active Trader account that is designed for high-volume investors. As Active Trader you can benefit from premium services and custom solutions, as well discounted pricing on your spread costs based on the volume you trade. With all FXCM account types, you pay only the floating spread to trade indices and commodities, while enhanced index CFDs allows you to trade without stop and limit restrictions or re-quotes. See below the average spread costs on CFDs, yet for most accurate data check official website or FXCM platform. FXCM allows leverage trade of Forex and CFDs, this tool brings an advantage even on the smallest market moves. In simple words, leverage is a credit shoulder that is given by the broker towards your trading account with a purpose to multiply the trading size of your positions. In fact, leverage can dramatically increase your potential gains, but in reverse may increase your loses too, thus you should use leverage very smartly, do not jump into high leverage levels but define correct size to each instrument. 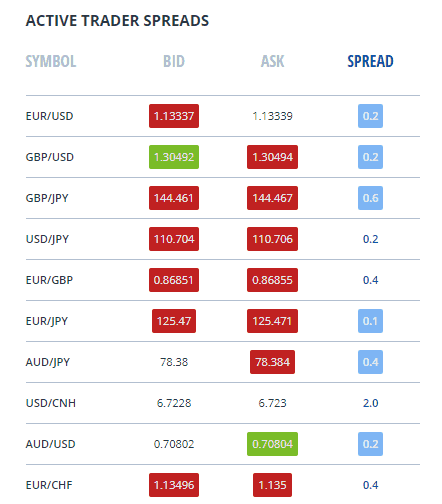 In FXCM different leverage levels are based on the traders’ experience and account funds, as well as the regulation which particular residents or accounts may fall in. New traders default to 50:1 leverage which can go up to 200:1 on FX and CFDs, yet respectively to Australian residents or holder of accounts under ASIC regulation. Otherwise, due to regulatory restriction in Europe under ESMA, the level up to a 30:1 on Forex products will be applied, 20:1 for non-major currency pairs, gold and major indices, 10:1 for commodities other than gold and non-major equity indices, 2:1 for cryptocurrencies. FXCM indeed conduct a very convenient way for account opening, so you can set a free practice account, which allows testing the platform and experience account benefits. And once you ready you can transfer to live trading, what is more pleasant the live account can be opened with a minimum deposit as little as $50. Once the account type settled up, you should continue with fund deposit that will allow starting live trading. 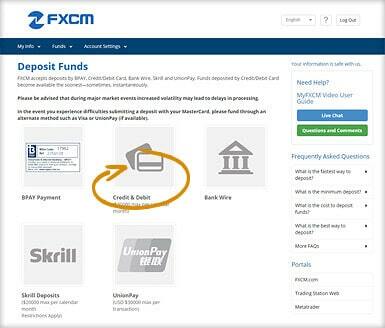 In these terms FXCM offers a range of funding options that usually process quick and safe transactions, which includes Credit and Debit Card, EFT & Bank Wire, as well e-payment via Skrill. Further on, when you wish to withdraw funds, you may use the same payment methods. There are no fees for withdrawals by credit card or debit card, however a $40 withdrawal fee will be charged for all Bank Wire requests. The strong background of the broker, years of successful operation and reputable in the financial world owning company is a state for the FXCM’s reliable and safe trading environment. As a trader you will definitely enjoy attractive offerings from the broker, along with the splendid technical development and a variety of tools to use. Active or high volume traders can enjoy their benefits with various available interfaces, good and competitive value spreads or offerings with advanced technical features. 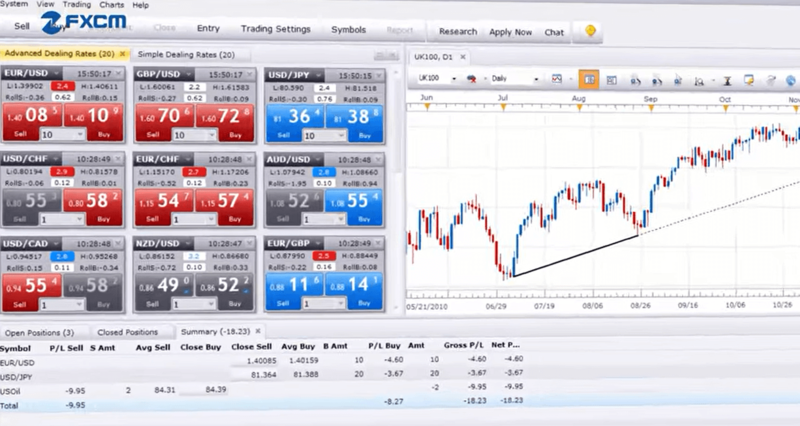 If you are a beginning trader, FXCM is an option too as there is no need of big deposits to start trading, supportive customer managers always remain on hand, along with unique educational technics with an absolutely impressive choice of tools to start, from Autotrading to the diversity of comprehensive supported indicators. Overall, FXCM is a good choice for all type of traders.